Large PDAs are rarely discovered in the adult patient. If present, they are often associated with high pulmonary blood pressures and pulmonary vascular obstructive disease (PVOD), which may be the result of the left to right shunt (the movement of blood from the aorta into the pulmonary artery through the open ductus (PDA)). This shunting may cause enlargement (dilatation) of the left chambers of the heart, resulting in heart palpitations (atrial fibrillation) and/or heart failure. Diagnosis of a small PDA is often difficult because of the lack of major symptoms. However, there will usually be a murmur, though often a mild one, and the patient may experience no symptoms. Symptoms of fatigue and/or shortness of breath in response to exertion is common in patients with larger PDAs. Very small PDAs producing negligible symptoms, called "silent ductus" because of the lack of a distinctive murmur, do not present risks and are usually left untreated. The PDA is best observed and evaluated through echocardiography, producing an echocardiogram, which will allow the physician to study its size and effects. 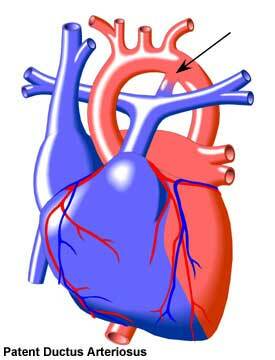 In some cases, a cardiac catheterization procedure will be necessary to confirm the diagnosis. If a significant PDA is found to exist, closure may be necessary in order to stop the left to right shunting of blood. PDAs are also closed in order to guard against infection of the interior lining of the heart (bacterial endocarditis, or BE). A catheterization procedure may be used to close the PDA through the insertion of an occlusion device, such as a coil or Amplatzer. These devices block the flow of blood through the PDA and encourage its anatomic closure. In other cases, the PDA will be surgically tied off (ligated) or separated. If calcification of the PDA in the older patient is significant, other means of surgical closure of the PDA may be necessary. After the PDA has been closed, medical follow-up is unnecessary in the absence of other symptoms. However, some physicians recommend periodic monitoring because a PDA that was closed in childhood will occasionally reopen in the adult patient and require treatment. This becomes less likely as techniques for closure improve. If the closure is not complete and a small leakage of blood through the PDA continues, then antibiotics may be prescribed to guard against infection (bacterial endocarditis).